In 1801 Daniel Easley sold the 633 acres of wilderness that eventually would become the University of Georgia to John Milledge for $4,000. 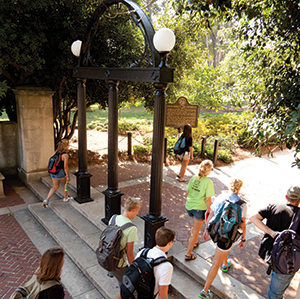 In the years that followed, the city of Athens sprung up on chunks of the land that were sold off by university trustees to finance academic buildings. Athens evolved into a center of textile manufacturing, and wealthy plantation owners and aristocrats flocked to the city to educate their offspring and enjoy the culture and society encouraged by the university. Now, just as then, Athens is a product of the unique symbiosis between town and college. It sits at the intersection of its own history and the vibrant indie-rock grittiness that gives the modern city much of its flavor. It’s a place that values its individuality but breathes in and out with the seasons of the university; Athens certainly isn’t dead during semester breaks and holidays, but it feels empty and expectant, as if waiting for students to return. And when they do come back, and downtown fills with hipsters in flannel and sorority girls in improbably high heels, the Classic City feels most alive.